Mutual aid equipment from Cal Fire and California's Office of Emergency Services can be provided. “It would be best if we had a mutual aid agreement in place, a document, so that if we ever do help our neighbors — and we will and they’ll help us — then we have a piece of paper,” City Manager Greg Garrett said. The City Council unanimously approved the agreement at its April 1 meeting. It did not previously have a formal agreement in place. The agreement between the county of Kern and other cities will assist surrounding areas and organizations in obtaining reimbursement of federal funds if a disaster is declared by the president of the United States, added Garrett. The city of Tehachapi is a participant of the Kern County Emergency Operations Plan and is in agreement with the Standardized Emergency Management System that the Kern County Board of Supervisors adopted on Aug. 8, 1995. The SEMS document outlines steps management in the fields of fire and rescue, law enforcement, medical coordinators and other organizations can take in the event of a disaster. The city’s mutual aid agreement recognizes the need to outline what resources are available to help other cities in the event of an earthquake, flood, hazardous material incident or other disaster. 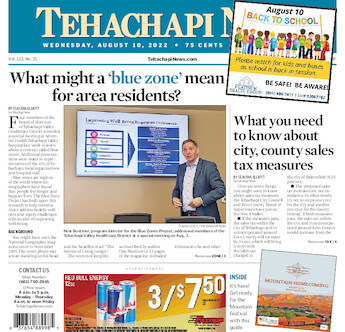 It does not require any party to deplete their own resources to the point they cannot provide services for their own area, according to documents from the April 1 Tehachapi City Council agenda. “This agreement will benefit all of the participating jurisdictions within Kern County by bringing together collective capabilities to address time-critical incidents that threaten public safety. All jurisdictions, no matter of what size, have limited resources,” Kern County Supervisor Zack Scrivner said in an email.